Ray Fougnier is a 71-year-old retiree, an Oneida Indian Nation member and a national award winning powerlifter. After only recently joining the sport, Fougnier qualified for the worldwide powerlifting championship in Johannesburg, South Africa this June. The Oneida Indian Nation is sponsoring Fougnier’s travel for the international competition. But the most touching part of Ray’s story is that he is not only in it for himself. He hopes that his active lifestyle and success in competitive powerlifting will inspire the Native American community, and children in particular, to also embrace fitness and health. Ray’s unique and inspiring story has been featured in various health and fitness media outlets in recent weeks, including the It’s Your Health radio show and The Mind-Body Shift blog. You can listen to Ray’s radio interview here. Check out the feature blog article here or read the full text below. When 71-year-old Ray Fougnier was in his late teens and early 20s, he dreamed of competing internationally in weightlifting, specifically in the Olympics. Then work, marriage and a family took over as top priorities. Little did Fougnier know that a half-century later, he would get to see his vision for international competition come true—he will be competing at the 2014 International Powerlifting Federation World Championships in Johannesburg, South Africa, in June. The former coach grew up playing sports and has remained active all his life with weightlifting, skiing and other athletic pursuits. Yet Fougnier didn’t begin powerlifting until just a year and a half ago. However, he looked into one of the powerlifting associations the man suggested, U.S.A. Powerlifting, the nation’s leading, drug-free powerlifting association. “The website indicated it was drug-free, which was certainly what I wanted,” said Fougnier, a man committed to healthy living, He found out people in local area were holding a meet and decided give it a try. Fougnier also found out that he was a natural at powerlifting. He won his first competition and claimed silver for his second. His third event was the national championship in Orlando, Fla. in July 2013. “I did pretty well,” he said humbly. 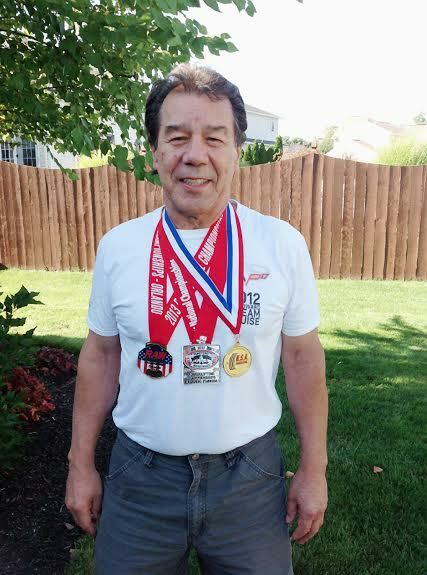 At the national championship, he won gold in the masters’ class (ages 70 and above) and qualified for the International Powerlifting Federation World Championships. He also broke the squat, deadlift and total weight records: the squat at 290 lbs. and total weight lifted at 890 lbs. The retired science teacher is a testament to how a healthy diet and regular exercise can improve your quality of life into the older years. He says older people are not resigned to a rocker on the front porch if they really want to feel productive. “Still be as active as possible, do whatever you want in life,” he said. Fougnier also is mindful of the food he puts into his mouth. He eats organic meats and eggs, lots of fruits and vegetables, nuts, whole grains—including carbohydrates that are “less likely to get you heavy.” He eats a diet low in sugary and fatty foods. Fougnier said he rarely gets sick. “I used to teach and be around kids all day, where you are more likely to catch some kind of cold. I’ve been retired for 9 years and maybe have been sick a couple times.” While he occasionally has soreness in his joints from lifting weights, he is on no medication. The father of three has tried to pass on his healthy habits by example, rather than dictation. However, he recommends people commit to eating right, getting rest, forming good sleep habits, staying away from drug or substance abuse of any kind and keeping active. “Get into regular exercise routine, whatever it is–lifting, sports, swimming,” he said. While Fougnier recognizes that plenty American Indians are still in very dismal situations, the bias against them as a whole has changed over the last 20 to 25 years. American Indians have become more prominent with the development of gaming and tourism, which has enabled them to put more money into their people, he said. The Oneida Indian Nation is sponsoring Fougnier for the worldwide competition in June. “The Oneida Indian Nation is thrilled to help make it possible for Ray Fougnier to travel to South Africa and compete in this prestigious worldwide championship competition. Ray is an outstanding Native American role model and a shining example of the values of the Oneida Indian Nation. We are very proud to have him representing us on an international level,” Oneida Indian Nation Representative Ray Halbritter said in a statement. To stay physically primed, Fougnier has competed at other events in between the major championships, continuing to work toward higher goals. He has gone on to win the Tennessee State Championship and the Michigan State Championship. Fougnier said that he has set goals for himself in the final stages of his training for South Africa. “I’m looking pretty good as long I stay healthy and not get hurt,” he said.